Remember Michelle Pfeiffer crooning atop that baby grand piano in 1989's "THE FABULOUS BAKER BOYS"? That famous scene was filmed at the Cinegrill nightclub at the Hollywood Roosevelt Hotel, just across the street from Grauman's Chinese Theatre. Other movies on location shot at the Roosevelt Hotel include 1990's "INTERNAL AFFAIRS" (with Richard Gere), 1987's "BEVERLY HILLS COP II" (with Eddie Murphy), and numerous TV shows such as "KNOTT'S LANDING" and Cybill Shepherd & Bruce Willis' series "MOONLIGHTING." In 1989's "AN INNOCENT MAN," Tom Selleck's character is sent to prison on a trumped-up drug charge. Near the end of the film, he and the cops stage a fake drug-buy in a parking lot, to nab the bad guys. That lengthy, night time scene (and the subsequent shoot-out) was filmed in and around Shoreline Village (407 Shoreline Village Drive, Long Beach), a themed shopping center near the Aquarium of the Pacific and across the bay from the Queen Mary. This same parking lot was used for a skateboarding scene in the 1995 movie "CLUELESS." If you drive along the coast in downtown Long Beach, you may recognize the circular tower at the southeast corner of Ocean Boulevard & Shoreline Drive/Alamitos Ave. It's not just that the International City Tower somewhat resembles the Capitol Records building; this round apartment building was featured in the opening scene of Mel Gibson's original "LETHAL WEAPON" (1987), where a drugged-out young woman jumps to her death from an upper-floor balcony. 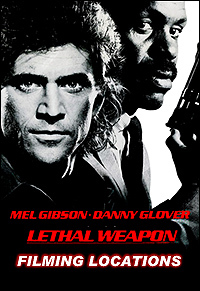 worth of "Lethal Weapon" locations.